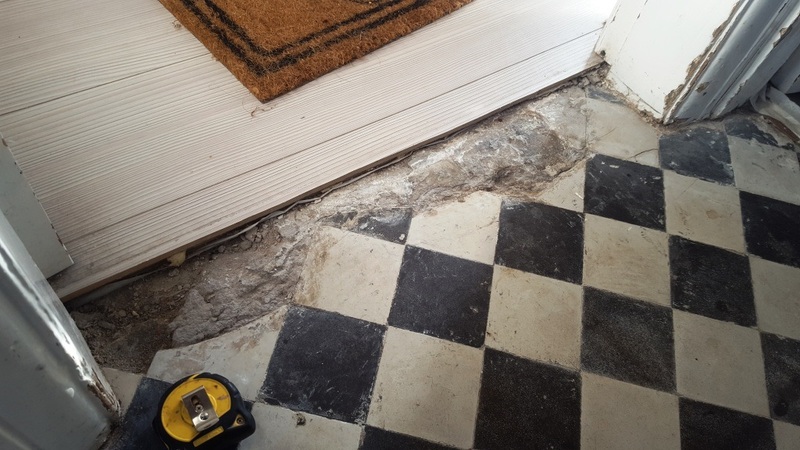 Our client in Rotherham had decided to install a new floor in their hallway and after removing many layers of old floor coverings discovered a layer of self-levelling compound underneath. 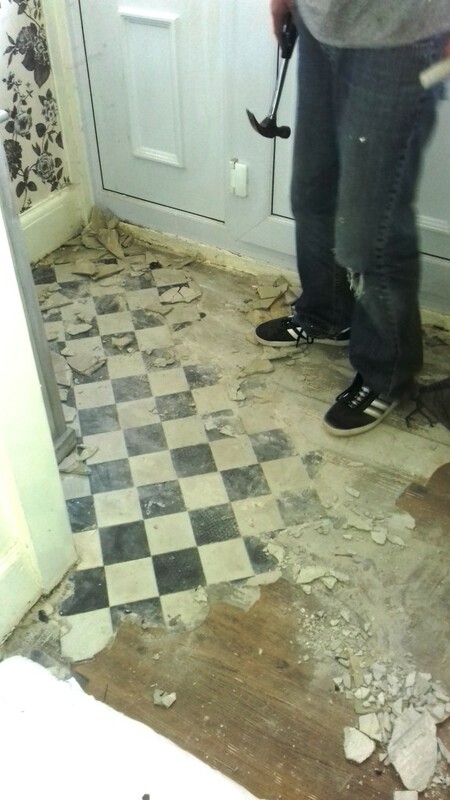 After deciding to chip some of this away they discovered what appeared to be an original Victorian tiled floor. 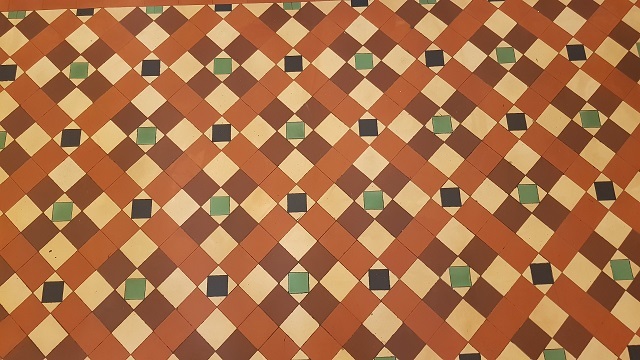 Realising that original features like these are very desirable they decided to call in Tile Doctor to see if it could be restored. Being the local agent for Tile Doctor I was asked to look at the floor and quote for doing the work. 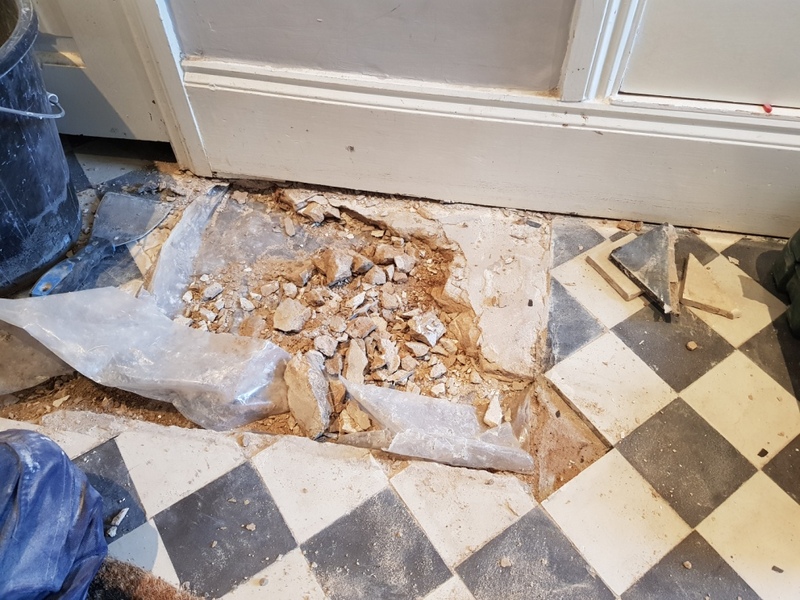 I could see this was going to take some time to do properly, the floor was quite seriously damaged, a big area of tiles were missing, the tiles around each doorway were heavily damaged and there were quite a few loose and cracked tiles around the edges of the floor. 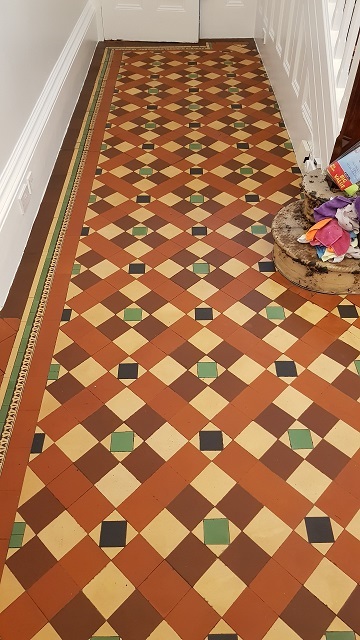 But we were confident this floor could be made to look amazing once again and add the original charm of this hallway back to how it was intended to be. 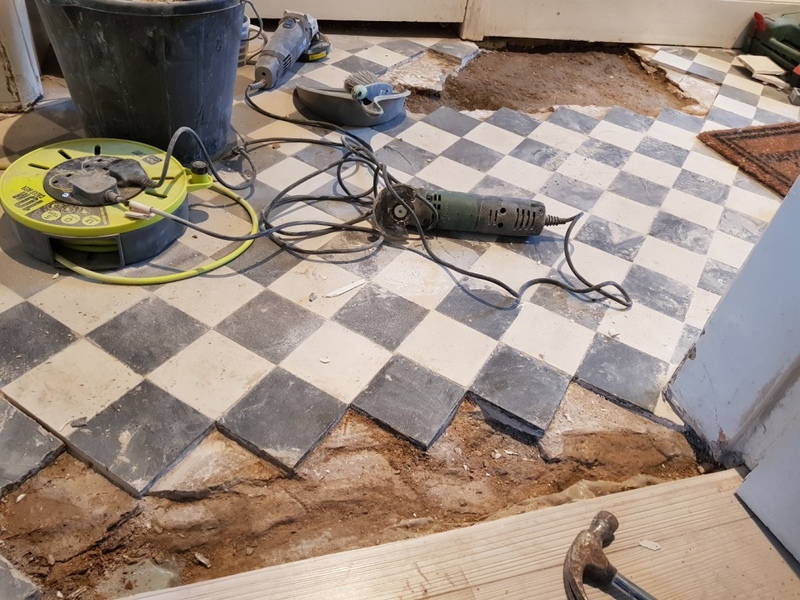 The first course of action was to make the tile repairs which included digging out and rebuilding the sub floor in some areas. 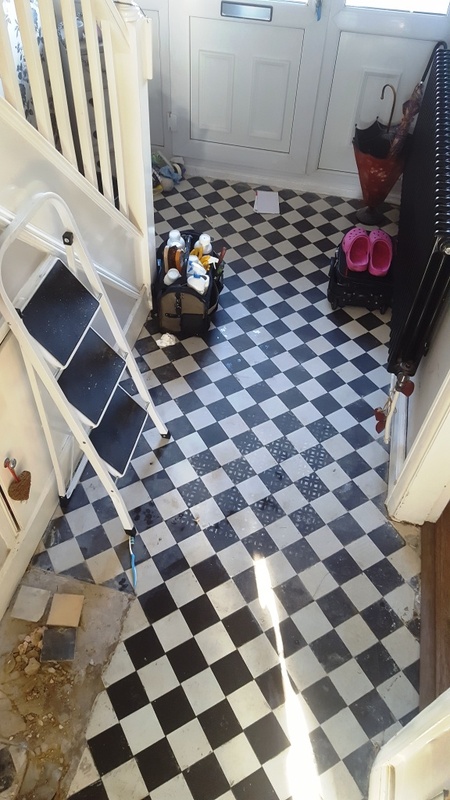 Fortunately, these black and white Victorian Tiles are fairly common, so I was able to source replacements quite easily. There was a lot of areas to cover so this step took a couple of days to complete. To get the floor clean we used a slow speed floor polisher fitted with a 200-grit diamond pad. 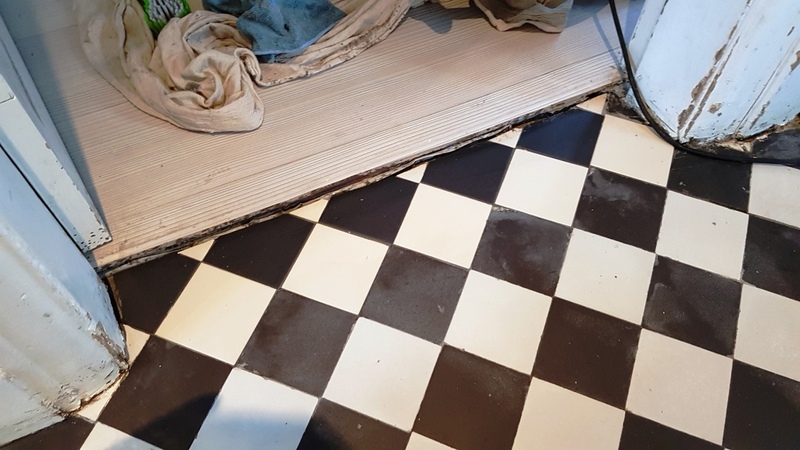 Aided with Tile Doctor Remove and Go it proved to be an effective combination that cut through and removed the self-levelling compound, it also worked a treat at removing paint stains too. The next step was to give the floor an acid wash to remove any remaining grime and dirt. To do this we applied Tile Doctor Acid Gel which being in gel form is quite easy to control. After being scrubbed into the floor it was extracted using a wet vacuum and then the floor given a thorough rinse with water to remove any traces of product. The wet vacuum was employed again to extract as much moisture from the floor as possible and then left to dry off fully overnight. The next day I returned to seal the floors checking first that the tiles were dry. 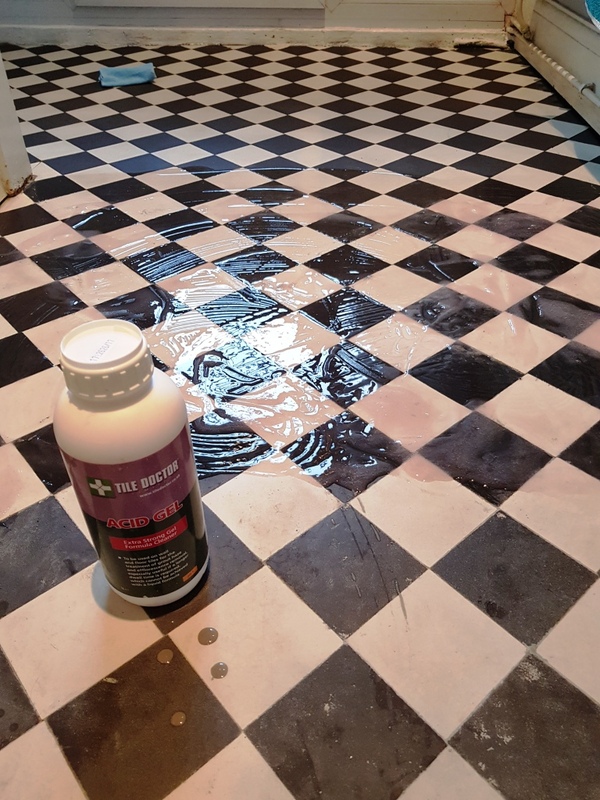 All was well so I began applying the sealer which in this case was Tile Doctor Colour Grow which is an impregnating sealer that works by soaking into the pores of the tile to prevent dirt from becoming ingrained there. 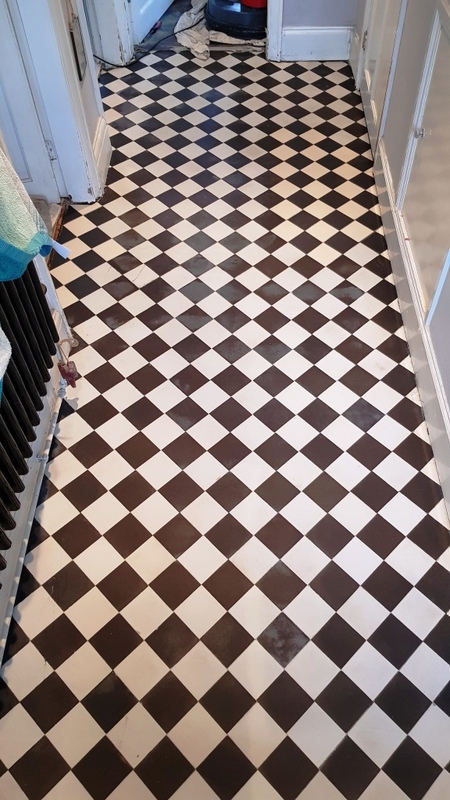 The floor was completely transformed over the course of five days and our customer was over the moon with the results calling it her ‘forever floor’. 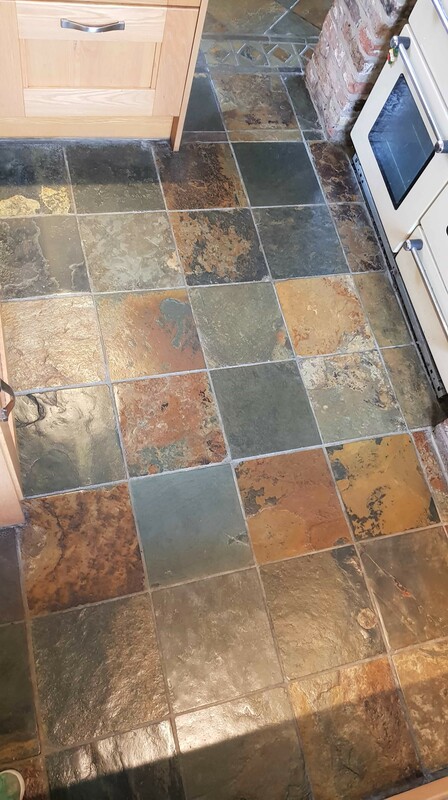 The owner of this house in Silkstone, which is a village situated in the foothills of the Pennines a few miles West of Barnsley, had inherited this Kitchen Slate floor from the previous owner of the house and in the years, they’d lived at the house they hadn’t done anything with the floor. 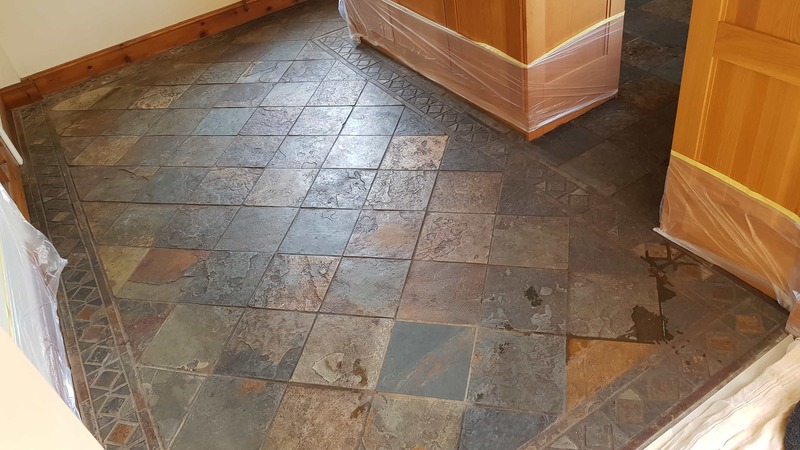 Slate tiles are beautiful but like any natural stone you really need to maintain the sealer if you want them to stay that way, once the sealer wears off dirt can penetrate the pores of the stone resulting in a floor that always looks dull and dirty. 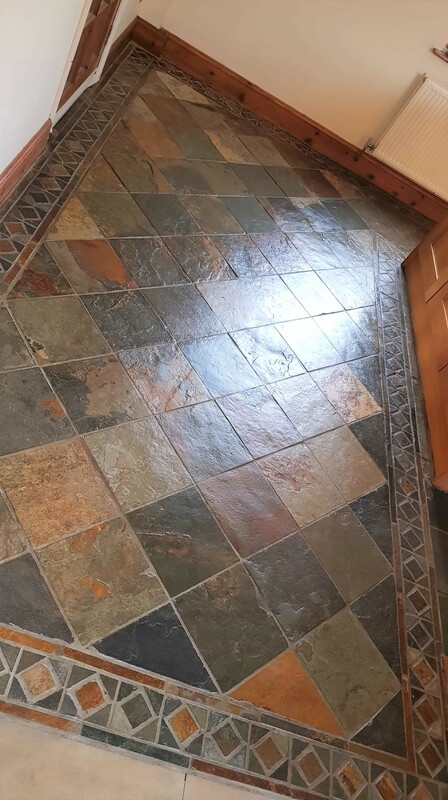 In this case of this Slate floor the sealer had worn off many years prior and a thick layer of grime had built up on top of what was once an amazing looking floor. 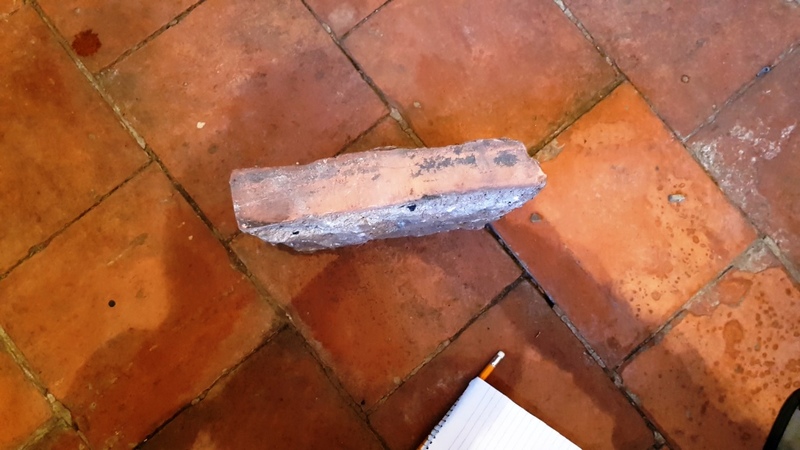 Stone floors never come with a care guide and the process of degradation happens so slowly, so you can understand how this could happen over time. Before starting I protected the wooden kitchen units from splashing using plastic sheeting. 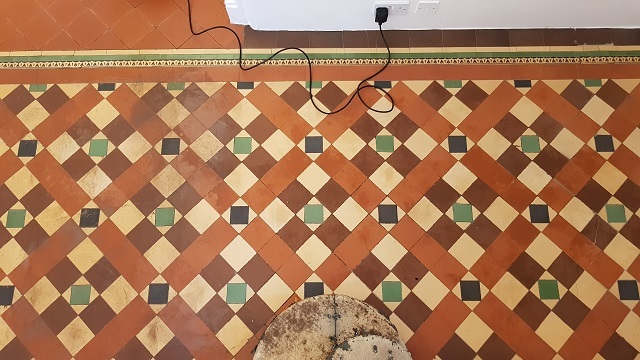 Next step was to soak the tiles in a strong dilution of Tile Doctor Remove and Go and Pro-Clean combined into a strong cleaning and stripping cocktail. 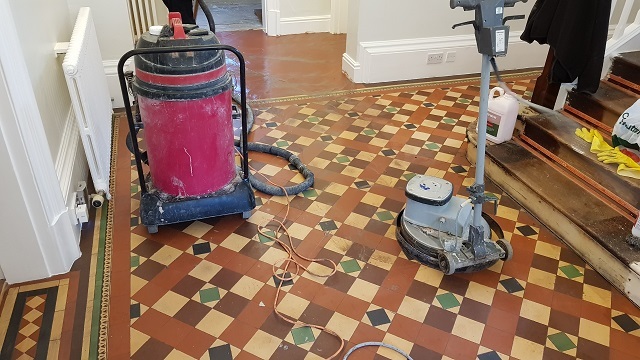 The solution was left to dwell for ten minutes before being scrubbed in using a black scrubbing pad fitted to a rotary floor machine running at slow speed to break through the grime and the sealers and oils that the previous owner had used on the slate. The pad is good at scrubbing the tiles but struggles to get into the grout so after the tiles were scrubbed I followed by running a stiff brush along the grout lines to give them a thorough clean. The soiled cleaning solution was rinsed off the tiles with water and then extracted off the floor using a wet vacuum. With the floor clear it was inspected, and problem areas re-treated using the same process. 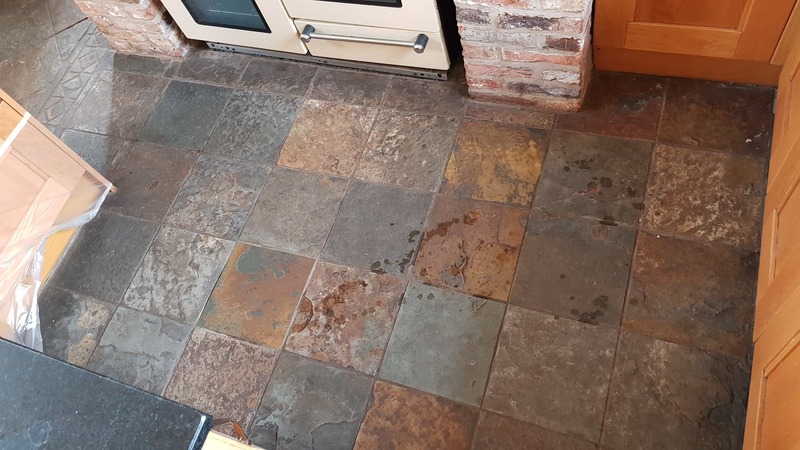 Once I was satisfied that the Slate and the Grout was clean and clear of old sealers I gave the whole floor a final rinse to remove any trace of cleaning products and then dried as much as possible using the wet vacuum. The floor was then left to dry out fully overnight. Returning to the property the next day, I ran some quick damp tests to check for any excess moisture that might have prevented me from sealing the floor. We will always do this as excess moisture can affect the sealer curing. Our client had previously decided that they liked the look of our High Shine Sealer due to how it brings the stunning colours of the Slate out. High Shine Sealer is a specially formulated water-based blend of acrylic polymers that provides both a stain resistant surface seal and a durable high-sheen finish. Four coats of sealer were applied and when the customer arrived home later that day they were totally blown away by the floor and how amazing it looked. 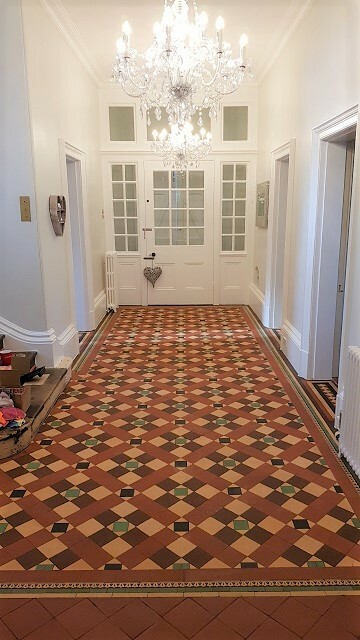 Our client had recently moved into this beautiful former vicarage in Sheffield, the hallway had a stunning Victorian tiled floor and there were quarry tiles in two adjoining rooms. 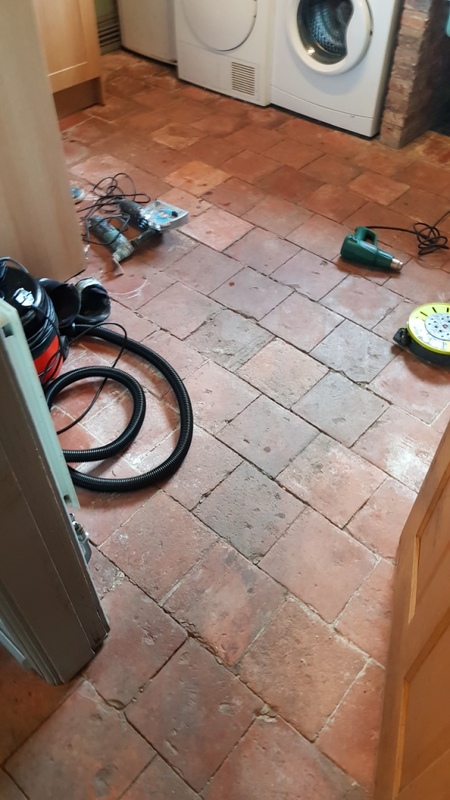 The floors hadn’t been maintained properly in quite some time and due to building work in the house they had become very dirty; the Victorian floor also needed some repairs doing as there were areas of loose tiles. 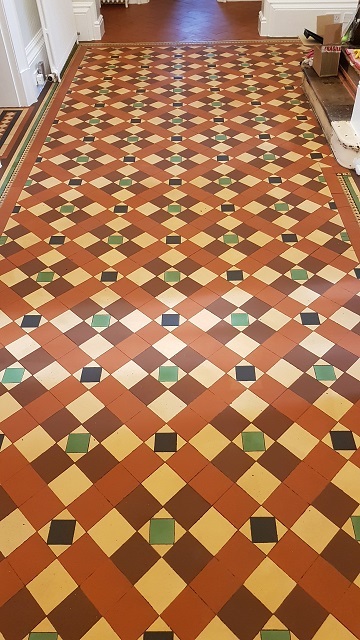 The new owner wanted the floors restoring which in this case meant making some repairs, deep cleaning the tiles and then sealing to protect them from further staining. I quoted for doing the work which was accepted and agreed a date to return and complete the work. 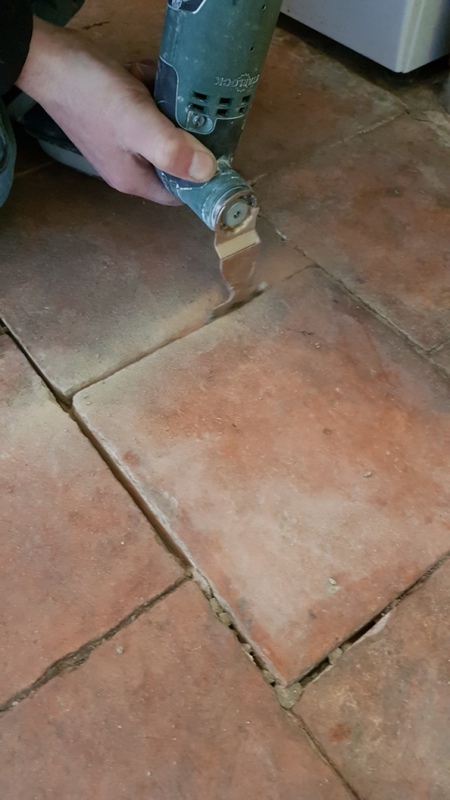 It made sense to start with the tile repairs first, so I inspected the whole floor for loose tiles and carefully removed them. 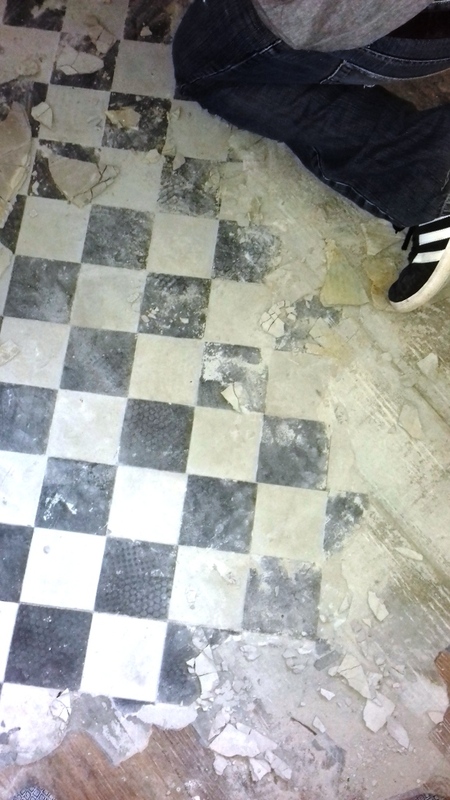 The tiles and floor were then cleaned up to remove the old adhesive and grout. 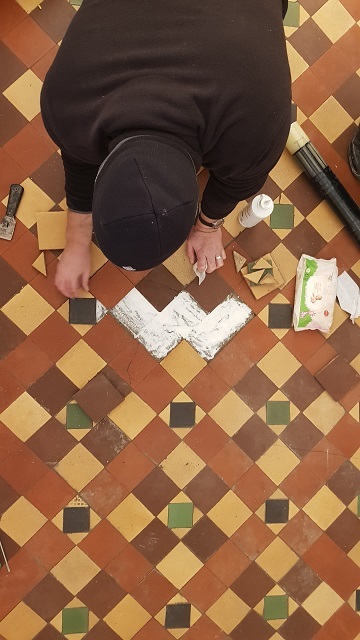 The tiles were fixed into place using a quick setting adhesive and whilst that was setting I started cleaning the floor, returning to grout the tiles later with a matching grout once the adhesive had set firm. 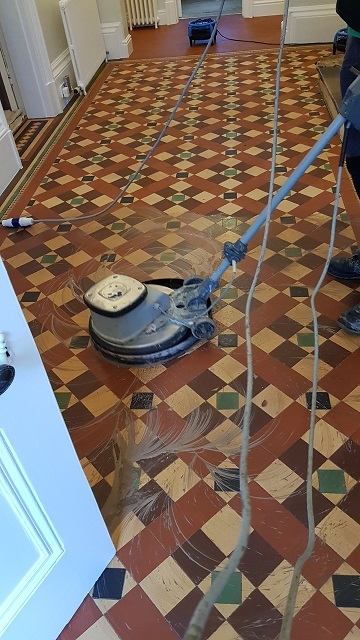 To deep clean the floor and remove any old sealers present on the tiles I applied a strong dilution of Tile Doctor Remove and Go. This product works best if you leave it to dwell and soak into the tile for about ten minutes before scrubbing it in. 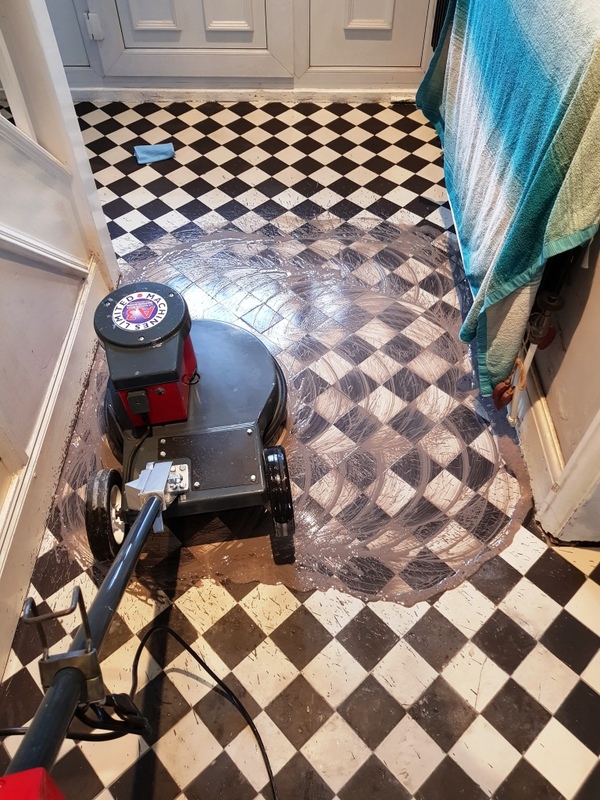 There was a large area to cover so I worked in sections and used a floor polishing machine fitted with a coarse 200 grit burnishing pad to grind off surface dirt and work the product into the tile to release the ingrained dirt. I ran the machine on a slow setting which helps reduce splashing and once the section had been cleaned I rinsed off the soiled cleaning solution with water which was then extracted using a wet vacuum. 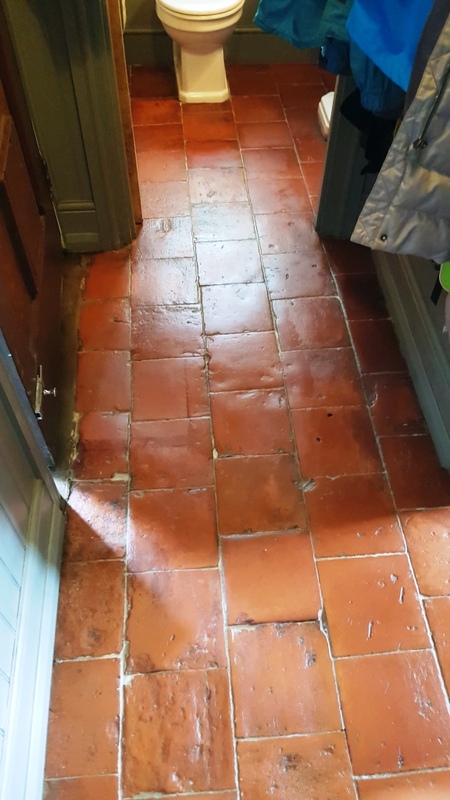 Once the whole floor was clean I followed up with an Acid Wash which removes old grout smears from the tile and neutralises any efflorescence salts inherent in the tile. 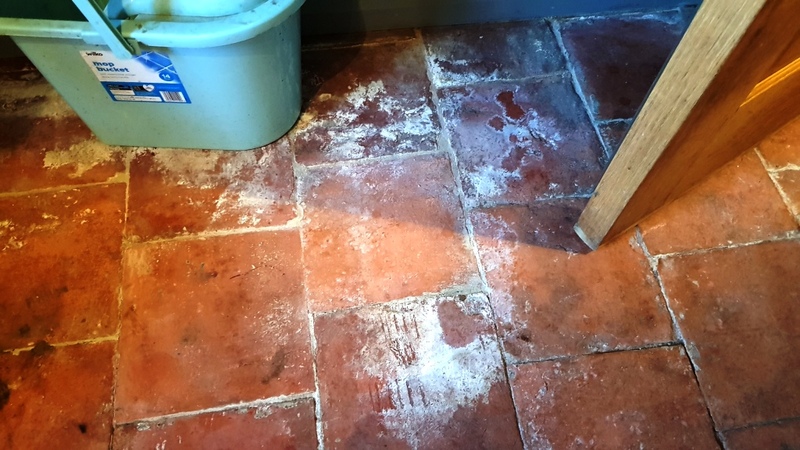 Efflorescence is a common problem with old floors where no damp proof membrane has been installed and can result in white salt deposits appearing on the surface on the floor. I used Tile Doctor Acid Gel for this step, being in gel form its easier to manage than other products and used the 200-grit burnishing pad to scrub it in. The slurry was then removed with a wet vacuum and the floor dried as much as possible with air movers leaving it to fully dry off overnight. The next day I returned to seal the floors checking first that the tiles were dry. 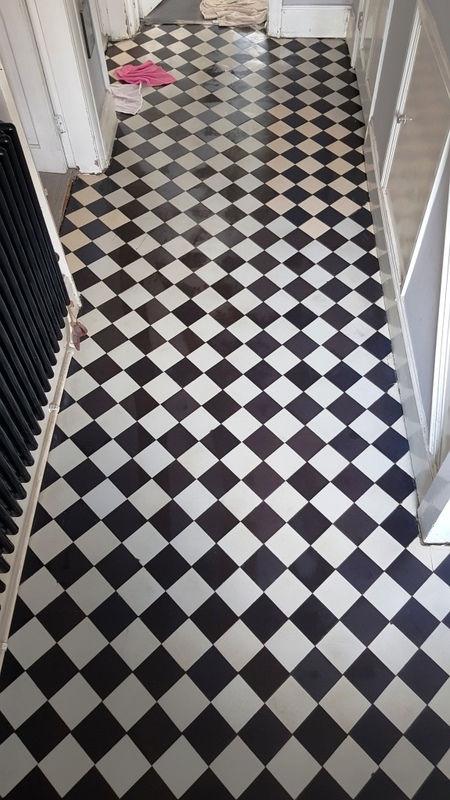 There are a number of sealers I could have used on the floor, but the owner preferred a matt appearance and I wanted to use a fully breathable sealer to ensure it could cope with moisture rising up through the floor due to the lack of the damp proof membrane. With these considerations in mind I choose Tile Doctor Colour Grow which is an impregnating sealer that protects the tiles from within by occupying the pores in the clay thereby preventing anything else from becoming ingrained there. The other advantage of Colour Grow is it’s a colour intensifying sealer that improves the colours in the tile. Only two coats of Colour Grow were needed, and I think you will agree the floor now looks very clean and so much more vibrant. 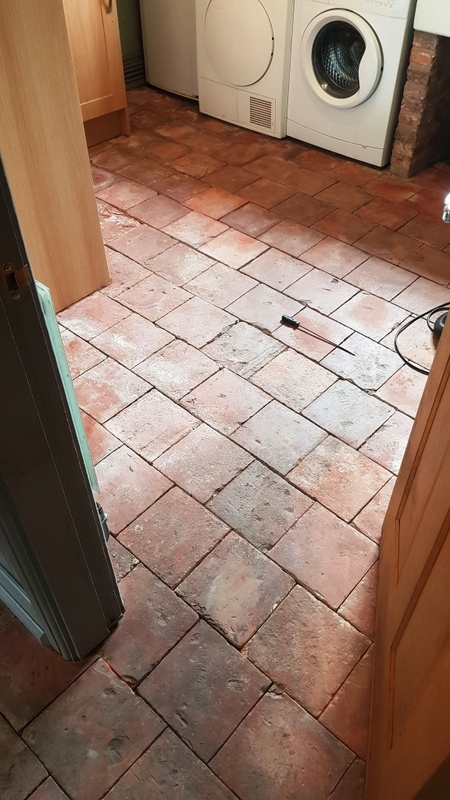 The owner of this house in the village of Silkstone near Barnsley had discovered this clay Pamment floor when they had a tiler come in to tile the floor. The tiler stripped off the Vinyl floor covering and removed an inch of Bitumen that it had been stuck onto. 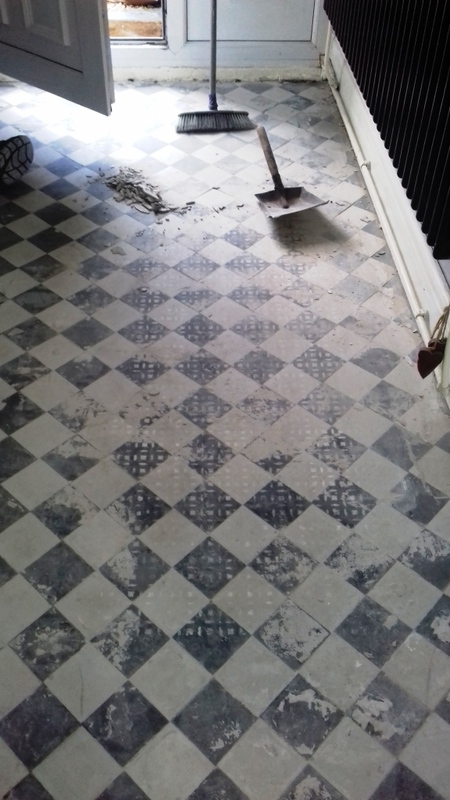 With the Bitumen removed it became clear that there was wonderful Pamment tiled floor already there. They had a go at restoring the floor themselves but eventually decided to call in the experts. Having been buried under Bitumen for such a long time the floor had a number of serious issues that would need addressing during the restoration. 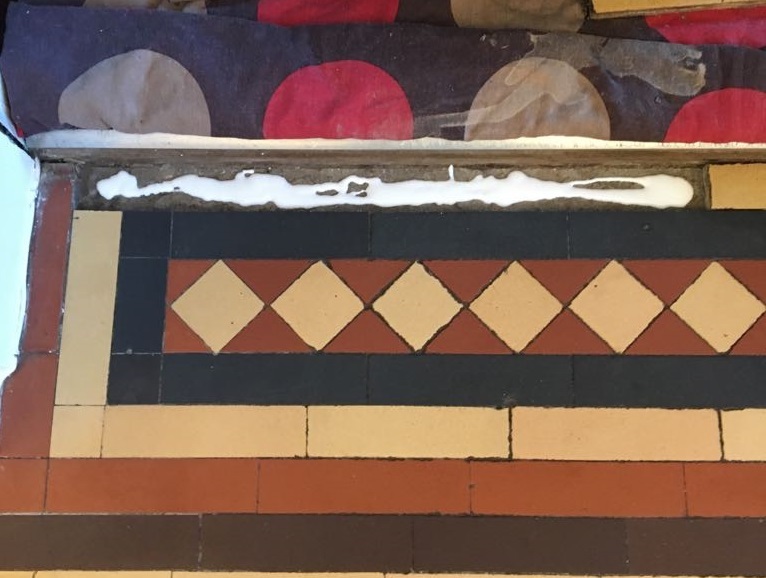 The grout/cement between the tiles was crumbling and there was a thick layer of dirt ingrained in the clay, there was also evidence of inherent salt efflorescence issues which manifests as white staining. Pamment tiles are very similar to Terracotta in that they are made from clay and like Terracotta are very porous and need to be sealed to protect dirt getting into the pores. You don’t normally see them in use in Yorkshire, but are quite a common in Norfolk and Suffolk where they are still made by Norfolk Pamments. Silkstone dates back to the Doomsday Book of 1086 and there are some very old houses in the village so you never know what your going to find. 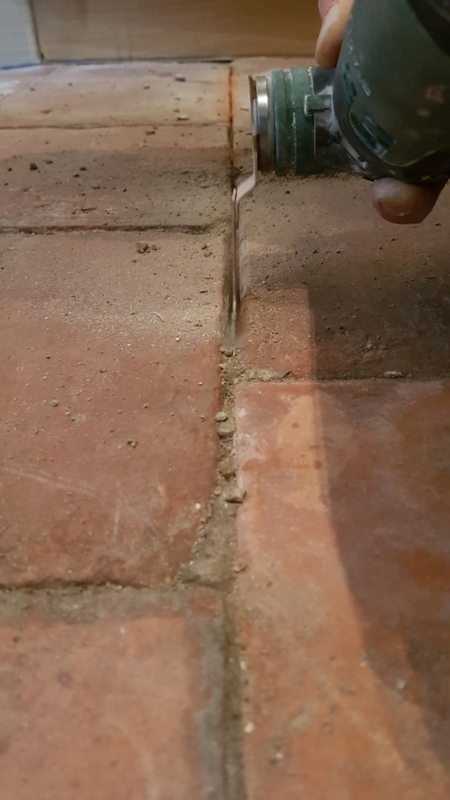 We removed what was left of the grout/cement from between the tiles using a special tool and replaced with a grout specifically made for wide joints. The next day once the grout had fully cured we came back to do the deep clean starting by applying Tile Doctor Pro-Clean to the Pamments and letting it soak in for ten minutes. 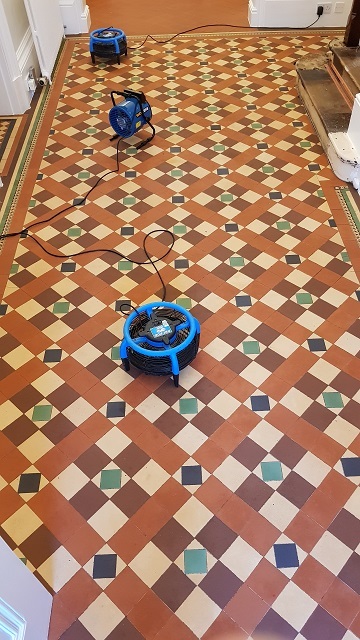 Then the tiles were scrubbed with a floor buffer fitted with a black scrubbing pad and running at slow speed. The floor was then rinsed with water and the slurry extracted using a wet vacuum. With the floor clear we could see that the process removed had most of the grime but there were areas that needed a bit more attention. 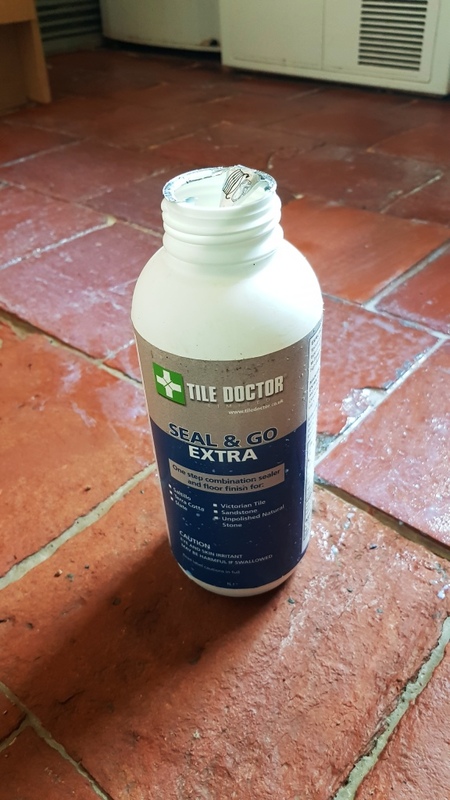 To tackle the stubborn stains and neutralise the effloresce salts that were in the tiles Tile Doctor Acid Gel was applied and scrubbed in. After a final rinse to remove any trace of cleaning product the floor was left to dry out for a few days. 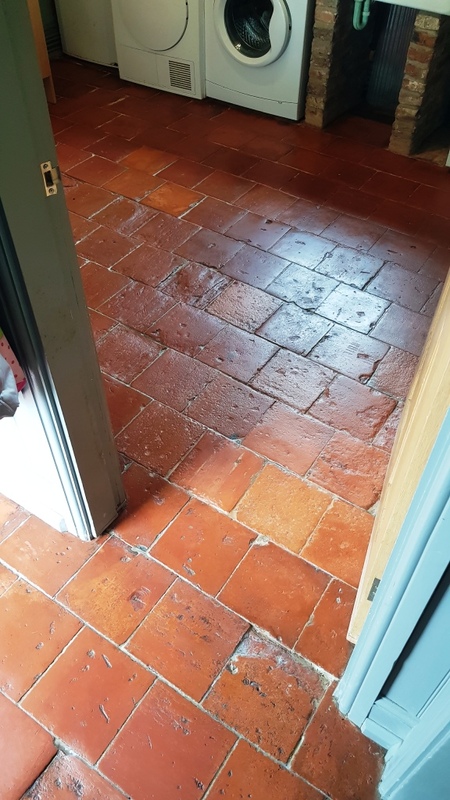 Due to the age of these tiles, the inherent efflorescence issues and the lack of damp proof membrane we sealed the floor in a fully breathable sealer ‘Seal and Go Extra‘. This provides a beautiful satin finish and allows the floor to breath and any moisture to escape. Our customer was delighted with the results and was so happy to restore another original feature of the house.